Tombs of Jahangir, Asif Khan and Akbari is part of the Tentative list of Pakistan in order to qualify for inclusion in the World Heritage List. Another day in Pakistan and yet another tomb……! But this one is of someone one has heard of - Jahangir, the 4th Mughal emperor. He was the intellectual, artistic, liberal, fun loving one (opium, alcohol and women!). His tomb is set within a complex of gardens called Dilkushan Bagh (= Garden of Contentment) at Shikura, a short distance outside the Lahore of those days. These had been built by his (20th!!) wife - Nur Jahan – and were used by her and his successor son Jahan as the site for building his mausoleum across the 10 years after his death in 1627. One notice board at the site claims that “the tomb is a monument of surpassing beauty and the finest ornament of Historical Lahore and is considered the most magnificent Mughal edifice in the Indo-Pak Sub-Continent after the Taj Mahal at Agra”. High praise indeed, and, even if not true, it does show that this is no “run of the mill” monument. This very illuminating “Assessment Report” from Feb 2011 by the Global Heritage Fund (http://ghn.globalheritagefund.com/uploads/documents/document_1705.pdf ) contains a nice set of “Statements of Significance” in a form which could well be adopted by UNESCO, including this one - “an elegant and visually stunning representation of Mughal rule, design and symbolism in the language of architecture and landscape”. So, what is “on show”? Well, the T List site definition identifies 3 elements. The “Tombs of Jahangir, Asif Khan and Akbari Sarai”. This might sound like the tombs of 3 people but, in fact, the 3rd element refers to the “Sarai of Akbar”. An alternative name is “Court of the Tomb” and it consists of a square enclosure with c180 accommodation “cells” for guardians and visitors, which surrounds a formal “Mughal” garden. The site is entered from the southern side of this courtyard. To the left and right through large gateways are 2 further square gardens each containing one of the tombs – that of Jahangir to the East at and that of the brother of Nur Jahan to the West. This latter is rather dilapidated and, when we were there during a “holiday”, seemed to be being used by all the budding cricketers of the town to practice their skills! It consists of a domed tomb set in what once were formal gardens – the pathways on either side of the empty “canals” provided an excellent run up for bowlers and wicket for batsmen. Indeed the entire site’s prime purpose seemed to be more as a public park than as a historic monument. Jahangir’s tomb consists of a large square (c80m per side) raised platform with 100ft high corner towers. Inside, accessed by a passageway from each side, is the main chamber containing Jahangir’s cenotaph. Leaving aside the general integrated design of the garden and built landscape, the real value from visiting this site lies in seeing the decoration of this chamber (photo). It is mainly inlay work (but also with frescoes) using techniques, designs and indeed actual stone sources as in the Taj Mahal – flowers but also geometric patterns and calligraphy describing e.g the 99 attributes of Allah. If (as we have!) you have ever bought a souvenir from Agra it may well have been an example of this type of stone inlay work as it has a flourishing “pietra dura” industry to supply the large tourist numbers there. 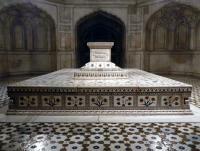 Jahangir’s tomb on the other hand received just 357 foreigners in 2009/10 according to the report referred to above! After you have seen the tomb area the chowkidar will justify his tip by opening a gate to let you up on to the platform and then a gate in one of the towers for a fine view over the entire site from the top! The total visit is likely to take from around 45 minutes depending on how “thorough” you want to be. There is another element of the original complex, namely the tomb of Nur Jahan herself. This is cut off from the rest by a railway line, presumably dating back to the days of railway construction by the British in the 19th C. It has not however been included in the Tentative List definition – probably for both authenticity and management reasons. It is in poor condition and has lost much of what was original – apparently it suffered more from the predations of Ranjit Singh than the other parts (though those too were vandalised and the Akbari Sarai use as residence). It has recently had a rather low quality replastering/redecoration on 1 of its 4 sides - a better job will be needed on any such work at the main complex if its integrity isn’t to be compromised. If you have a car you might as well visit it unless you are very short of time. On which matter - the site will only take around 20 minutes to reach from the Lahore Fort area. It would be a shame not to get out to it. So, what are its chances of future inscription? Well the list already has 2 Mughal tomb inscriptions - Humayun’s (1572) and the Taj Mahal (c1653) with both having Mughal gardens, as well as a Mughal garden without a tomb at the nearby Shalamar (and others in the 3 inscribed Mughal forts!). Fine as the main funerary chamber is, it seems difficult for a strong case to be made out on a “comparability” basis for yet another tomb/garden complex? This one straddles the dates of the other 2 and I don’t know enough about Mughal architecture to comment on whether this is significant for a “unique” stylistic argument. I guess it partly depends on the politics at the time of any proposal. In any case the site needs a lot of preservation work done on it.